IbuzzPro Review – Is iBuzz Pro A Low Tech MLM Lead Bonanza Or Outdated Tool? So what exactly is iBuzzPro and what exactly can it do to get you to that magical $10,000 ++ income level in your direct sales or Network Marketing business? Now I have been in the home based business industry for over 25 years and I know that the single biggest problem that people who are trying to start a home based or network marketing business have is generating an adequate lead flow to power their business. Let’s face it, without leads your business is pretty much dead. I mean how many times can you go through your warm market list? How many hours can you spend at a coffee shop trying to chase down likely prospects? Now I have always been a fan of high volume lead generation and it was in fact learning that single skill that allowed me to drive my MLM business to over $1.5 million a year in income in less than 3 years. The fact is that generating huge lead flow and knowing how to handle that lead flow can make you a superstar in any business. Now of course I am a big fan of generating leads online using systems like My Lead System Pro, since that is where a huge volume of traffic is today, however there are many good offline strategies that I have used for years to drive big traffic, and they are not complicated, you just need a little coaching on how to implement them. Before embraced the world of online marketing, one of my core approaches for several years was using a marketing approach called voice broadcasting to generate huge consistent lead flow. 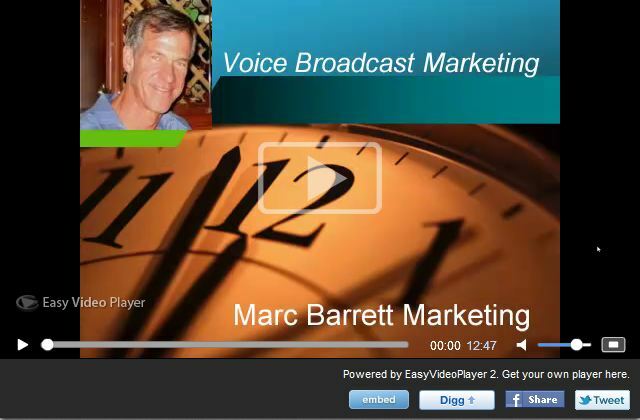 Using voice broadcasting and some creative scripts I was sponsoring well over 10 new reps a month into my network marketing business using a voice broadcast system called iBuzzPro. Voice Broadcasting is actually an automated telemarketing service where you can buy a data list of prospects for your industry, upload them to a voice broadcast company’s website, record a short phone script message about your opportunity, and push a button and boom! The web based software will then dial hundreds or thousands of numbers and deliver your message to live prospects or leave your recorded message on the voice mails of those that don’t answer. Now the key here is the automation, these systems can generally dial and deliver that message to 3000 or 4000 numbers in about 30 minutes or less. Now using this as a lead sifting tool can be killer if you do it right since it allows you to rapidly sift through let’s say 1000 prospects in a few minutes and even if only 1.5% respond, you now have 15 highly qualified prospects that have listened to your screening messages and had indicated they are interested. Want another 15 prospects? Just do it again or next time blast out to 2000 prospects and get 30 leads! Costs for this type of automated voice broadcast marketing generally range from 2.8 cents to 12 cents or more per connected call. That means that you could voice blast 1000 prospects for as little as $28. This can be done with any type of list from opportunity seekers to Genealogy lists to Real Estate Brokers, basically anyone who qualifies as a business list prospect. In today’s market this approach works much better than approaches like mass e mail, especially in today’s market where there are so many spam filters that it’s surprising that anyone’s e mail even gets through to a prospect. Once big advantage of this type of marketing is that by the time your leads come in they are pretty highly qualified. They have been sifted by listening to a short 30 second message that qualifies them, they have expressed interest by pressing the 1 button on the phone to get more information, and then the are transferred to a 5 minute screening voice mail message to further qualify them for interest and they then leave their name and number. So these are not cold leads when you call them, they are waiting for your call and actually want to talk to you. Not that is pretty different from most types of phone marketing where people don’t really want to talk to you, voice broadcast leads have been pre-sifted and qualified. Using “Voice Broadcasting” Technology With iBuzzPro. Now the typical response some people have when hearing about this MLM lead approach is to say that “I always hang up on those robo-calls, they are so annoying.” Their thought process is that since they hang up, everyone does, which is a very incorrect assumption. So let’s examine the facts, does voice broadcasting work to generate MLM leads? The answer is yes and as a matter of fact it works very well. What does not work is a bad script. Most people who do voice broadcasting to generate MLM leads use terribly unimaginative scripts. The difference between success and failure in voice broadcasting is in “copywriting” (writing a powerful script). So let’s assume you have a good script or you have gotten some good coaching from someone who has a successful approach, now down to the nitty grity. What are my options, how does it work, and what are the numbers? First some quick numbers: Over the last 7 or 8 years using this type of marketing system my numbers have ranged from 0.75% to 5% or more response ratios. That means if I did a voice broadcast to a list of 1000 prospects I could generate anywhere from 7 to 50 leads on average so yes, this marketing approach works very well. There are many companies who offer voice broadcasting services in today’s market, but the big split is between companies who charge no setup fee such as “Voice Shot” and companies who do charge a setup fee like “iBuzzPro” and Lead Net Pro. Companies who do not charge a sign up fee will all charge higher rates for the automated calls they make for you, and companies who do charge you an up front fee like iBuzzPro and Lead Net Pro, charge a lot less for each call. So although it looks to be a better deal on the surface to go with a company that has no upfront fee, if you end up paying $0.12 per connected call as opposed to $0.028 per call which is what iBuzzPro charges, then you will end up paying a lot more for the no sign up fee company even in the short run. For example if you run a voice broadcast campaign and blast your message out to a list of prospects and you have 5000 connects (where the system reaches either a liver person or a voice mail) then you would pay $600 in connect charges with companies like Voice Shot. Now if you did the same call blast using a system like iBuzzPro your cost would be $140, pretty big difference. You would actually have saved the cost of your system purchase of $397 in your first day with the iBuzzPro system. Once you have your system setup and are ready to go, the next step is that you are going to need some leads to send your messages to. Now of course with any type of marketing, there are some inside tricks to this that you will want to learn from someone who has actually had a lot of success using the system but basically there are a number of categories you can target. Consumer Data Lists: This is basically just a list of phone numbers usually based on zip code or area code parameters, these lists are cheap and actually they are free within the IbuzzPro system but you can no longer use them. Voice broadcasting falls under Telemarketing laws and the Federal laws changed a few years ago to no longer allow telemarketing or voice broadcasting to consumer lists. This was actually a big favor to the entire industry because this type of list was a total waste of time and money to broadcast to. Your leads need to be targeted or it will cost you too much money even if you are only paying pennies per call. Business To Business Lists (SIC code lists): These are data lists based on Standard Industry Classification codes. You can basically find a list of any business category you want to target such as Insurance Brokers, or Construction Workers, etc and broadcast your message to them. This type of list is allowed because Business to Business telemarketing is exempt from Federal Do Not Call regulations. This can be a great area if you target your list to one that would be a good prospect for what you are selling. These lists are also free within the iBuzzPro system. Active Network Marketers: This as you may guess is probably a good target market. These leads are what’s called “scraped” leads, they are harvested from MLM companies replicated websites. Now since there are probably 10 million or more MLM distributors just in the US market alone, and each of them gets a company replicated website when they join an MLM, I don’t’ think this lead list will ever run out. These are very targeted since we know they are already sold on the value of a home based business and also lets be frank here, the average time a network marketer works an MLM before they are off in search of success with some other company is about 120 days or so. So this market is always transitional. These lead lists can be bought through IBuzzPro for about $99 per 10,000. Scrape Your Own Leads: If you like the Active Network Marketer list area you can purchase scraper software for an additional charge that will go out to the internet and scrape you own MLM leads off of company replicated websites as I mentioned above. You can also use this same software to generate your own FREE leads from many other areas online. With iBuzz this software is an additional charge however with other systems like Lead Net Pro, this software is included with the system purchase. Other Voice Broadcast Lists: There are many areas to choose from, Business Opportunity seeker leads, Surveyed leads, MLM Genealogy list Leads, just to name a few. iBuzzPro maintains a lead store where you can buy leads and if you have a knowledgeable sponsor in iBuzzPro they probably have their own resources for leads as well. The iBuzz Pro compensation program has been changed as of 2013. They now only charge a $29.97 monthly fee and no longer pay the big commissions on the front end. However competitive products such as Lead Net Pro still do. Now the other advantage that using systems like iBuzzPro have over the straight up commercial systems is that iBuzzPro is an affiliate marketing product that you can make money re-selling. For every person you bring into iBuzzPro that pays $397, you will generate a commission of $300. That’s over a 75% commission. Also these commissions do not come from iBuzzPro, you will actually have your own payment links within iBuzzPro through either First Data or Alert Pay and when someone signs up the $300 will then be deposited directly to your account. You simple setup an account with one of those payment processors and then use the simple back office instructions and you get paid direct. You can of course just have your buyers send you a check instead but the instant pay feature by having credit card payment links on your site is really the way to go. The iBuzzPro income potential is actually much bigger than it first appears, since the compensation plan uses what in direct sales is called a One Up compensation plan. That means that when you sell someone a system and then they go out and do the same thing by marketing iBuzzPro to their prospects, they have to generate one sales to qualify themselves and that $300 commission goes to you. So it’s actually like receiving $600 per sale from any customer you have that is going to be reselling the system. Now the one up compensation plan goes one step further by paying also paying you on the first sale of everyone that is passed up to you to infinite depth. Suffice it to say that a lot of marketers have made some very big bucks marketing this system, some raking in multiple 5 figure incomes per month. Another element in the iBuzzPro compensation plan is the ability to generate residual commissions. To stay active on the system all members must pay a monthly subscription fee of $29.97 per month and for every person you have introduced to the system you will receive $10 per month in residual. So if you have brought in lets say 10 people you would make $100 a month, if you brought in 10 per month over 6 months (60) then you would be generating a monthly residual of $600, not bad. This residual also falls under the One Up compensation model so you can get leveraged compensation here also. The commission structure is so profitable that many people have joined iBuzzPro just to sell the system other network marketers rather then use it to build their direct sales or MLM business. Now there are two different ways you can use the iBuzzPro system to generate profits, you can use it simply as a tool to generate leads for your home based or MLM business, or you can purchase iBuzzPro and them focus on making money just by re-selling the system. Now as you know with duplication being the operative principal in network marketing, when you bring in a distributors using some marketing approach they will generally want to duplicate exactly what you are doing to build their business, so not only will you generate a new distributor for you MLM business but then also a sale of the iBuzzPro system and also an additional monthly residual. If you do this then you will be targeting the same markets but approaching them with a marketing tool they can use to build their business. This uses a very different approach and of course you must get some coaching on the way to modify the scripts so that you maximize your results. Marketing Statistics – Does iBuzzPro actually work? A good marketer of course has to also be a numbers person to be able to track and optimize their profits, targeting the markets that are best and eliminating those that don’t work. Here are some statistics from my use of the iBuzzPro system over the last several years. Direct Marketing of A product, Direct Sales opportunity or Network Marketing business: My numbers have averaged from 0.75% to 1.25% which translates to about 7 to 12 leads per 1000 connected calls. Marketing iBuzzPro as a Marketing Tool: The number here are higher and in the range of 1.5% to as much as 5% or more but there are a few tricks of course to doing this. So in the final analysis, voice broadcast is a very powerful marketing tool if used correctly and does generate results. Its low tech and not hard to understand and when combined with the profit potential of a affiliate product link iBuzzPro can really make your marketing successful and profitable in more than one way. Due to recent changes in the iBuzzPro business model and adjustments in the cost of voice broadcasting I no longer consider iBuzzPro to be the best choice for a Voice Broadcast marketing system. They no longer appear to be keeping pace with the market or maintaining their technology very well. The lead in this market now appears to be with their main competitor Lead Net Pro, who has a very lucrative compensation plan that pays you $300 for selling one of the systems and also has the advantage of allowing you to voice broadcast not only to the US and Canada but also in other international markets like the UK and Australia. In addition iBuzzpro no longer offers a discount on lead scrapers and those must now be purchased separately which can cost anywhere from $150 to $297 where Lead Net Pro still offers lead scrapers for free. Now even though systems like iBuzzPro can give you some killer results, like any other marketing tool there is a learning curve but with voice broadcasting its pretty small. Also when I coach my students on being successful and profitable I always stress using multiple marketing strategies to generate leads. I am a big believer in also using Online Marketing approaches which although have a little bit more of a learning curve, tend to generate huge results that employ even more leverage and automation. Systems like My Lead System Pro are designed to not only teach newbies how to generate leads online but also supply them with the websites, capture pages, autoresponders, etc, making it a very powerful addition to anyone’s marketing strategy. Nice article this is valuable information about IbuzzPro review is iBuzz pro a low tech MLM lead Bonanza Or Outdated tool. This is very useful to all marketerss. Thank you for posting.